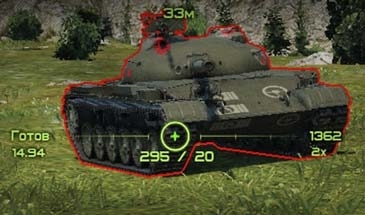 23rd July 2017 | Filed under: Sights World of Tanks	and tagged with: 9.19.1.1, crosshair, scope, Sight, Sight "Destroyer"
Sight «Destroyer» for World of Tanks 0.9.19.1.1 — is a minimalistic but useful and functional sight for your game. The author is Andre_V. This sight it displays only the information you need while leaving plenty of space for aiming. The sight shows the number of rounds in the drum, calculator enemy armor, zoom ratio in sight and the recharge time. Sight «Destroyer» is made in soft light and green colors, and the font readable. 2.Copy folders gui and scripts in WOT / res_mods / 0.9.19.1.1/, confirming a replacement. One Response to "Sight “Destroyer” for World of Tanks 9.19.1.1"
were i set the font ?